A running toilet is sort of like a bad comedian; it just doesn’t know when to stop. Whether it’s running sporadically or constantly leaks into the bowl, your toilet is wasting a lot of water and the sound of water running is probably keeping you up at night. Depending on the size of your leak, you could be losing between 30 and 500 gallons of water per day for silent leaks and potentially much more for leaks that you can hear. In most cases, it is possible to fix a running toilet without needing the expertise of a licensed technician. There are just a few simple steps to follow. 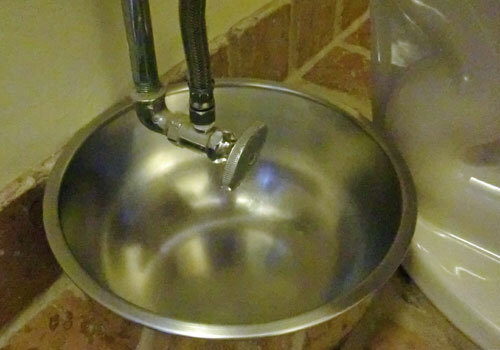 Before diving in, first turn off your water (silver knob located on the wall behind your toilet) and then cover the basics. Toilets have remained virtually unchanged for the past 100 years. Well, in America that is…Japan is a different story. In order to figure out which part of your toilet is leaking, it’s important to know what and where each component is. You may be wondering if the water in your tanks is dirty. Well, it’s not! The water in your tank is clean, so it’s perfectly all right to adjust parts without having to wear protective gloves. Although, if you want to, by all means. B. Rubber flapper blocking the tank water from descending into the bowl. It is connected to the toilet flush lever above. C. Pump that refills the tank after it empties. D. Float that raises and lowers with the water level to tell the pump when to go and stop. E. The overflow tube, which sets the high water level in the tank. So now that you know where each part is located, it’s time to figure out where exactly the problem is. Let’s start piece by piece. While inspecting your toilet flapper, you probably noticed the chain that connects the flapper to the toilet flush lever. The chain should be short enough to not get stuck between the flapper and the drain and long enough to be able to be able to lower the flapper over the drain without much tension. We recommend having about a half inch of slack. And clearly, if the chain has come undone or disconnected, you will need to reconnect the chain to the handle and the toilet flapper. You can readjust your chain with wire cutters or needle-nosed pliers. Test your toilet chain by flushing the toilet and jiggling the handle. Get your screwdriver and locate the the screw adjustment above the pump (C), which is connected to the float ball rod. 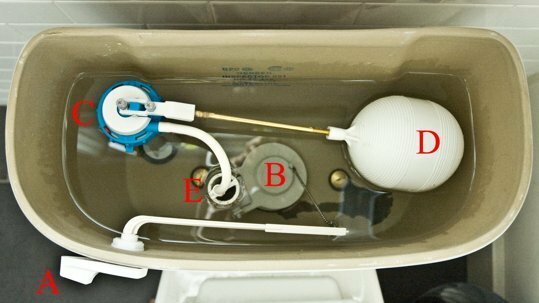 As you tighten the screw with your screwdriver, the ball float should lower, which will hopefully solve your water level problem. Ideally, the water line should be between 1 inch and a half an inch. Make sure the water is off. Close the valve that located below the toilet. If there visible mineral buildup, you can try using some vinegar and a wire brush to clean it off. Drain the tank by flushing the toilet. If you closed the valve underneath the toilet, no water should fill the tank back up. You can use a cloth or sponge to soak up any excess water in the tank. Now that the toilet tank is dry, you can replace any part you need. After you have done the necessary repairs or adjustments, try turning the water back on and flushing the toilet to see if you have fixed your running toilet problem. If you need to make a bigger repair, like replace the fill valve pump, see this Family Handyman article. For more information and facts on toilet and other plumbing leaks, see this EPA page. 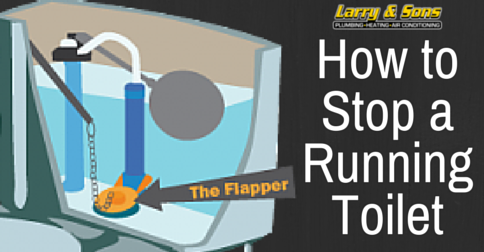 If you are still having trouble finding or repairing your running toilet, there may be a more serious issue at hand. Give Larry & Sons a call at 301-733-5428. Check out our maintenance plan; we provide fall and spring HVAC tune-ups, provide 15 % off all repairs, and much more!